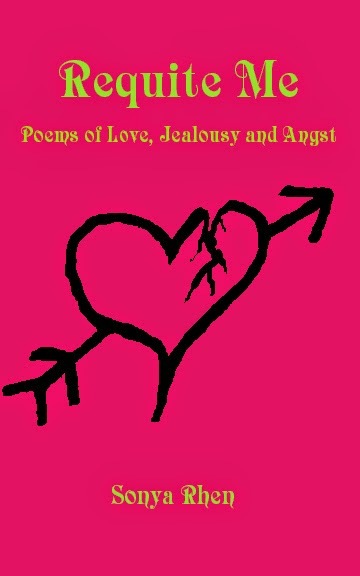 Please tell us a little about your book of poems Requite Me: Poems of Love, Jealousy and Angst? I like the phrase 'Unrequited Love' and I always wondered if there was a 'Requited Love'. Looking it up, I found that requite is like payback. While I never hear anyone using that word, I liked the idea of it and chose that for the title of my poetry book. The book contains poems dating back from grade school with the last poem written about 2009. The idea of it formulated from a request by a friend for a poem I had written about her and dedicated to a boy that she liked. I wrote it in Jr. High and I think it was even published in the school 'newspaper', which was really more like a newsletter. When I looked for her poem, I came across many others that I had written. I thought I would like it if I had them all in one place instead of scattered in different notebooks and scraps of paper. This book of poetry is for my friend and myself. If others find value and joy in reading it, then that’s a bonus! I’m no expert on poetry, but I enjoyed re-reading what I had written and my friend is thrilled to have the poem I wrote for her in book form. How have you found the process of self-publishing? Is there anything that you would do differently next time? I debated a long time about self-publishing the novel that I wrote. During that time I was also compiling all my poetry into one document. It seemed like it would be easier to self-publish the much shorter poetry book than the novel, so I thought I’d try it and see how it worked. I had heard of Create Space through the National Novel Writing Month program and checked it out. It was really easy, but I did spend a long time reading about how to format my book and set everything up. I had to learn about Create Space’s submissions process, book formatting and uploading the right files. I had to learn how to use Open Office and create different 'Styles', 'Headings', a 'Table of Contents' (TOC) and figure out why sometimes what I was trying to do wasn’t working. Formatting is not an easy thing and I still haven’t mastered it. For the eBook side, I went with KDP (Kindle Direct Publishing). I could have submitted the files straight from my print book formatted files, but I didn’t think they would look as nice, since they were formatted for print books with print book margins, no clickable TOC, etc. I edited my book using Scrivener for Windows and I was easily able to produce a Mobi file for upload. I lost some of the poetry formatting, but I think in the end I came up with a nicer product. For the book cover, I had originally wanted to do a collage. I wanted it to look like something that a young girl might have doodled and pasted on the cover of her notebook or school book cover. I tried a bit of cutting and pasting letters, but in the end I thought it looked too busy. I knew a little Photoshop, so I sat down and decided to draw out the cover by hand on the computer. It was a simple design, but I liked the way it turned out. I don’t think I would ever have tried to get a traditional publisher to publish my poems. I am thrilled that there is a self-publishing option to be able to do this. In fact there are many options available to writers now. I actually love being in control of what my cover looks like, where to put my poems, how they flow on the page, and how soon the book comes out. I do feel like I am still not done with 'this time' for publishing as there are still so many more options of where I can upload my book to. I’m working on getting the formatting ready for Smashwords, so I can have eBooks in Barnes and Noble as well as the print book. I would say for next time, that I might try and get the Smashwords format ready a lot closer to the Create Space and KDP release dates. Tell us about poetry month and what you will be doing on your blog in April? I only stumbled across National Poetry Month last year when I found this image online somewhere. I thought it was a great idea and I posted one of my poems from the novel that I was working on at the time. I thought about doing the same thing this year. Then I thought, since it is National Poetry Month and not 'Day', that I wanted to post more poems throughout the entire month. That thought grew into one poem every day and having guest bloggers post their poems. I’m very excited by the response and the contributions that I have been receiving. You can check my blog every day in April and find a different original poem by guest bloggers and myself.